Aliases: Wolverine referred to him as "Man-Mountain"
Powers/Abilities: This unnamed mutant seemed capable of sustaining himself without conventional food for long periods of time see comments, and could mentally generate multiple energy bodies see comments at vast distances. Due to his mental problems see comments the energy bodies, or "Shadows" represented different aspects of the mutants personality; the Black Shadows represented his destructive side, and the White Shadow was a reaction against his destructive side. The energy bodies had fighting skills and agility sufficient to fight Wolverine, plus superhuman strength (at least Class 10) and durability. Their intangible bodies provided resistance to physical attacks, but they could also make themselves solid at will. They could generate explosive energy bursts capable of disintegrating their targets, and two shadows fought they generated enough explosive energy to disintegrate an entire city block. Also they could generate freezing cold on touch. They could also draw an opponent into themselves, where they were presumably either frozen or disintegrated see comments. They had a limited ability to communicate mentally, and appeared able to mentally detect or track others. History: (Marvel Comics Presents #45/1(fb)) - The family of the mutant that would become Black Shadow/White Shadow was killed by one of shadow's early manifestations. Twenty years later it appeared while the mutant was being examined by his doctor. The doctor was killed by the Black Shadow. The local villagers feared the mutant and attacked him. The mutant resisted letting the Black Shadow out and was rendered unconscious. He hoped the villagers would kill him. Instead he was taken to an asylum and left there. Over time the mutant became hideously obese, and whatever staff and clients had lived at the asylum all passed away presumably Black Shadow killed them. (Marvel Comics Presents#40/1, 41/1(fb)) - The Black Shadow made enemies of Ch'un, Hsiao and Mai. They began to hunt it, but it turned the tables and began to hunt them instead. It followed them from Pingnan to Hong Kong. (Marvel Comics Presents#38/4(bts)) - The Black Shadow vaporised an entire city block in Hong Kong. Mrs. Linn Chow, a friend of Wolverines, was killed. (Marvel Comics Presents#39/1, 40/1, 42/1) - As Wolverine was investigating Linn's death, the Black Shadow reappeared and was attacked by the Hong Kong Police. It drew one of the Police into itself, and Logan shouted for the Police to leave. Thrusting his arm into its body up to his elbow, Logan felt the intense cold. As the Black Shadow continued to attack Logan, the White Shadow appeared. The two Shadows fought, and the resultant energy release destroyed their surroundings. They disappeared. The Black Shadow appeared in a village in China and began rampaging. Hsiao charged at it with a pack of explosives on his back. He leapt into the Shadow, but the resultant explosion didn't harm it's energy body. The White Shadow appeared and gestured for Wolverine and his friends to leave. Then it began fighting the Black Shadow again, leading to the disintegration of the immediate area. (Marvel Comics Presents#43/1(bts)) - At the asylum where the mutant had been left to die, the two shadows argued. The Black Shadow sensed Ch'un and Mai approaching and threatened to destroy them, causing the White Shadow to retaliate. The Black Shadow took Ch'un and Mai prisoner. (Marvel Comics Presents#44/1, 45/1, 46/1, 47/1) - Wolverine found Ch'un and Mai chained to the rafters in the asylum. The White Shadow warned Wolverine away before the Black Shadow arrived. Instead Wolverine attacked the White Shadow, but his hand froze on contact. The White Shadow threw him outside. Wolverine returned only to face the Black Shadow this time. He leapt through the Black Shadow, reappearing frozen on the other side and moving into the next room. Inside that room was the mutant creating the shadows. As Wolverine studied the mutant, the Black Shadow appeared out of its chest. While Wolverine fought the Black Shadow, the White Shadow appeared. Once again it tried to convince Wolverine to leave. The Black Shadow tried to blast Wolverine and one of its blasts hit Ch'un instead. It threatened to kill Mai next. Wolverine attacked the Black Shadow, but was backhanded across the room. The Shadow's continued to fight each other, and the White Shadow tried to end their existence's by killing the mutant that had created them. Although the Black Shadow prevented this, Wolverine stepped in and tried to help. 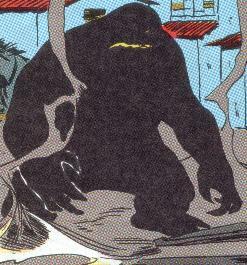 The mutant created more Black Shadows to defend itself, and eventually the White Shadow was overpowered. Wolverine fought his way through the Black Shadows to the mutant. Seeing Wolverines claws, it threw itself onto them. The Black Shadows slowly began to fade away until only one remained. Eventually the final shadow exploded, destroying the asylum. 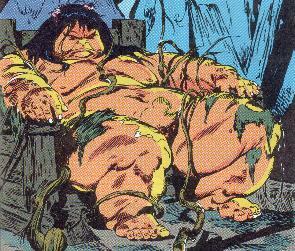 As I said in the powers section, the mutant seemed to be capable of going without food. It had supposedly been many months since he had been left at the asylum, and his body was not only overgrown with moss and vines (suggesting he had not moved in a long time!) but incredibly obese. Also, it's not entirely clear what happened to those who where drawn inside the Shadows body. While I assume the energies within either froze or disintegrated them, perhaps that was how the mutant "fed". In fact Black Shadow said of Mai: "Meat can be rendered. Then sweetened to the taste. The woman is next. Then, at last, you will follow as a feast well deserved." though he may not have meant it literally. Furthermore, he could generate multiple shadows. The most seen was six black shadows and one white. However the extra Black Shadows were only generated when Wolverine approached the mutant, and as such it was a response to a threat. 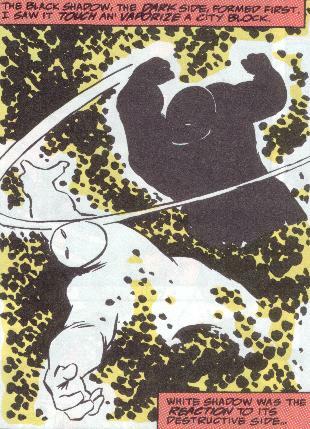 It is entirely possible the mutant could've learnt to generate more shadows (both white and black). Kyle Smith: You're right: schizophrenia, a severe psychotic disorder characterized by hallucinations and delusions, is commonly misidentified as multiple personality disorder, now known as disassociative identity disorder. Disassociative Identity Disorder (DID) was previously distinguished as a neurosis but now falls under the category of disassociatives, disorders where the normal integration of consciousness, identity, or memory is temporarily and suddenly altered. Several professionals have discounted and contested its existence, but then again there are certain scholars who claim that mental illness does not exist at all since it is a social construction. Ch'un was a city based school teacher until the Black Shadow slaughtered most of his pupil in front of his eyes. He joined Hsiao and Mai in their hunt for Black Shadow. They met Wolverine in Hong Kong, and it was Ch'un who alerted them when Black Shadow reappeared. 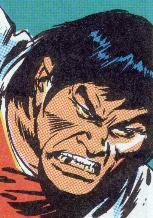 After Hsiao's death, he and Mai travelled to the asylum without Wolverine, despite Ch'un's reluctance to leave him behind. He and Mai where captured by the Black Shadow. He was later hit by a blast of energy meant for Wolverine. Hsiao was a country farmer whose land was destroyed, and his grandparents killed by the Black Shadow. He was the strong guy of the group. When Mai introduced him to Wolverine he challenged him and then punched him in the face. In return Wolverine sprained his hand. Later on he sacrificed his life in an attempt to stop Black Shadow with explosives..
Mai was a young Chinese woman who worked in the hospital when the mutant was admitted. Her husband and child where killed by black shadow. She joined Ch'un and Hsiao in hunting the monster. 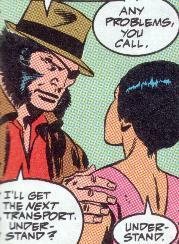 When Wolverine was mistaken by Hong Kong Police for a looter in the wake of Black Shadow's attack, Mai helped him escape them. They joined forces to stop Black Shadow. After Hsiao's death she and Ch'un headed for the Asylum without Wolverine. They were captured by Black Shadow. Mai was saved by Wolverine. 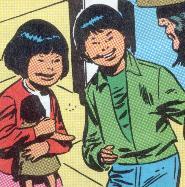 He stayed with her a couple of days to make sure she was ok.
Linn Chow approached Wolverine, whilst he was using his Patch identity, about how her children had been taken to Hong Kong by her husband, Peter. Although Peter had hurt her and she was scared to go find her children, Patch encouraged her. She approached her lawyer and travelled to Hong Kong. Sadly she was killed by Black Shadow. 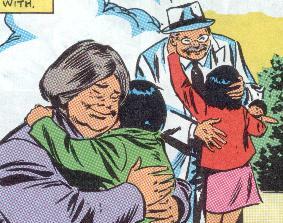 Patch still retrieved her children from Peter and returned them to their grandparents in Madripoor.